Accurate measurement of a signal depends on the dynamic range and the overall level of the data acquisition system. The overall level setting may be thought of as determining the largest signal that can be measured. This clearly depends on the present gain setting. That is the overall level is related to the gain. Clearly if the overall level is too small (gain too high) then the signal will be clipped and we will have poor quality data. The dynamic range then tells us that for the given overall level what is the smallest signal we can measure accurately whilst simultaneously measuring the large signal. In a very simple sense suppose we have an artificial signal which consists of a sinewave at a large amplitude A for the first half and that this is followed by a sinewave with a small amplitude a for the second half. We will set the gain (the overall level) to allow the best measurement of the A sinewave. The dynamic range tells us how small a may be so we can also measure that without changing settings. Actually what we have is three signals, the two sinewaves plus the noise generated by the measurement system. This noise is always present. Whilst it has little apparent effect on A it clearly sets how small a may be. 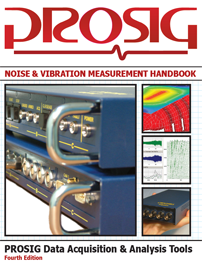 This measurement noise comes from many sources, including the transducer, the cabling, the signal conditioning and the ADC. The above analogy is not the whole picture but it does give some concept of what overall level and dynamic range mean. This dynamic range measurement is carried out at a specific gain setting, usually at a gain of 1. In most cases the dynamic range is reasonably independent of the actual gain but at high gains, say over 1000, the dynamic range tends to drop. This is because the gain amplifier generally becomes more noisy at high gains. However this may be offset by reducing the frequency bandwidth at high gains – but that is a different situation. Table 1 below shows the relationship between the input voltage range, the gain and the overall level in terms of voltage. For voltages the standard dB reference value is 1 volt. For comparison Table 1 also includes the overall levels that would be achieved for a microphone with a calibration of 50mV/Pa. For audio measurements the dB reference is 2* 10-5Pa. The overall levels shown above are the peak levels. Often rms based overall levels are preferred. For a sinewave dropping the peak overall levels by 3dB is sufficient. However for more complex signals one should use a higher safety margin. Typically the ratio between the peak of a signal and the rms level, which is called the crest factor, is rarely above 4 for steady state conditions. Hence in this situation the peak overall level should be reduced by as much as 12dB to get the rms overall level. In summary then setting the overall level (the gain) determines the maximum signal input level and the dynamic range specifies the amplitude range of the signals we measure. If the overall level is LdB and the dynamic range is RdB, then we can measure signals whose amplitudes are in the range (L-R)dB to LdB.